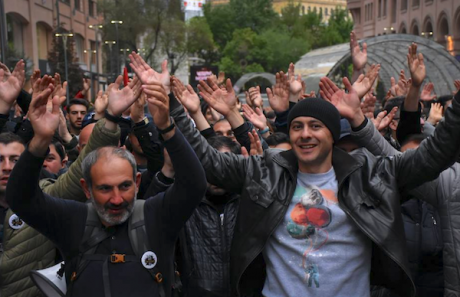 15 April: Armen Grigoryan (right) marches together with protest leader Nikol Pashinyan. Source: Koryun Shekoyan / Facebook.In the past two weeks, Armenia’s protest movement has achieved remarkable successes. From forcing the resignation of the country’s leader for the last ten years, to escalating demands to remove the ruling Republican Party from Parliament, this mobilisation has been able to be as ambitious as it has been because of the broad support it has across the country’s regions and classes. Armen Grigoryan, who currently works at Transparency International Armenia, has participated in various political movements in Armenia over the past five years. He was campaign manager for Andrias Ghukasyan’s 2013 presidential campaign. In 2015, Grigoryan ran the No Pasaran campaign against the proposed constitutional reforms that would eventually turn Armenia into a parliamentary republic. This is a two part interview. The first part was taken on 21 April, two days before Serzh Sargsyan’s resignation. At the end of the interview, Armen was arrested on criminal charges of “inciting mass unrest”. He was released after Sargsyan’s resignation. How was this movement able to mobilise? How did its dynamics develop? There are perhaps several components that have come together to make this mobilisation successful. Initially, there were three initiatives: the civic movement Reject Serzh, the Civic Contract Party, and the other is the Armenian Front. So, it is a representative movement. 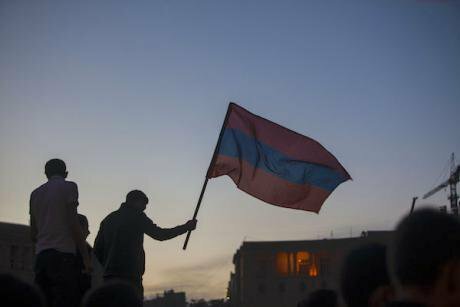 We — these three initiatives — have tried to mobilise the Armenian political field. Nikol Pashinyan has been working within his Civil Contract Party, and the others have been working within their initiatives, and I think that it has been a success. That is the first thing. The second thing is that this has been a positive movement — there has always been an emphasis on positivity to give people positive hope. For example, we have used a lot of humour in our campaign to desacralise the political field and to subvert it. The third thing is that the movement has been based on peaceful civil disobedience. I think this has been one of the most important factors in the movement’s successful mobilisation. Through peaceful actions we can give people safety. Obviously, it was understood that police might detain participants, but that would be for three hours, maybe longer — but that there is no danger. Further, we have a networked, decentralised style of mobilisation. We do not tell every individual what to do. Of course, we have told them generally what to do: for example, to throw away all the portraits of Serzh Sargsyan from schools, or to shut down streets. But the people organised themselves for this on the local level. And I think that citizens are in shock. How are people able to organise themselves? On 20 April, around 50,000 people came out into the streets. What has changed in terms of organising strategies in this movement? Are there people who are organising now that weren’t organising in past movements? Yes, there are new people. For example, a couple of people [in organising roles] were very new, but there are also people from previous movements. I think that all the previous movements: Voch Talanin (No to Plunder), No Pasaran, Electric Yerevan, Mashtots Park — all of them have led up and contributed to this movement. They have formed the foundation of this movement. We have learned a lot. For example, the positivity of this movement was taken from the No Pasaran mobilisation, where we saw that it worked and brought results. 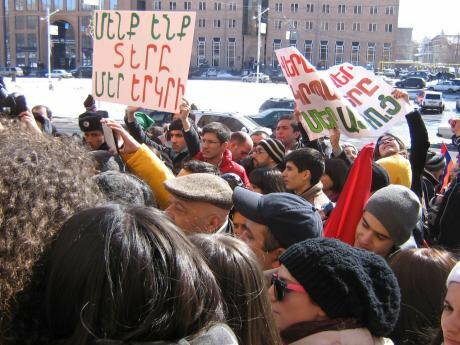 January 2012: people gather to protest illegal constructions at Mashtots Park, Yerevan. CC Wikipedia.This experience that we have accumulated — and it is true that the authorities have also learned and gained experience — but every previous movement’s experience was brought into this one. For example, the Voch Talanin movement used car processions, and that has been used here. And now it’s a mix of all this experience. It shows. It is clear this movement has been very well organised. For example, the rallies are much more interesting and energetic. Before, opposition rallies were very boring, with what felt like 45-minute lectures. Our first rally was more of a show. We had someone come out in a cheburashka costume on stage [a reference to the fact that, for some, Sargsyan looks like the well-known Soviet children’s character]. We tried to break from the old format of rallies where someone would speak for 45 minutes about the situation — people already know the situation very well. It was necessary to change that and do things in a different way. We decided we must be very creative. We brought balloons with Serzh Sargsyan’s face on them and let them go. We tried to bring a show aspect to the rallies, and that had a positive impact. Who are the participants of these protests? It is clear the movement is being led by students, but there are also elderly people, people from low socio-economic backgrounds, and the intelligentsia. Can you tell me more about who they are and how that affects the dynamics of the protests? There is a very big gulf between the police and these protesters in terms of their world view. When this police officer sees these women protesters, he is in shock. Firstly, he thinks he should approach her with respect and that he thinks he is supposed to do this and that, but in this situation he just does not know what to do. And it is clear that law enforcement is in a big crisis. It is also a cultural shock for the whole system of governance. 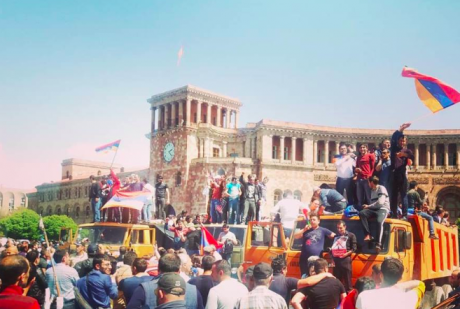 25 April: Republic Square, Yerevan. Source: Mikayel Zolyan.I think in this way, this is a real revolution. And this is happening on various levels. For 30 years after independence, there is this thing that has built up in Armenia, a lot of experience, a lot of demands, and a great dream. And this is how you make it a reality. I am convinced that this is also the result of peoples’ dreams. People have been thinking about this moment for a long time, they have been working towards this, they have gone to pursue education, they have prepared short films, they have been involved in the arts. All that has led to this moment. We are all in shock about how this all happened, but this is the result of peoples’ dreams. How many people did this mobilisation begin with? Our first march had 100-150 people. This started with a very small group of people. People told us that we would not achieve anything and that nothing would change. We told them: just wait. This mobilisation does not have a geopolitical aspect. Electric Yerevan in 2015 did have that aspect, and as a result, a disinformation campaign was launched by Russia against Armenia in the early to middle stages of that movement. Why is this geopolitical component seemingly lacking from this movement? Firstly, the mobilisation was successful because it was a purely domestic Armenian contention, and there is no role played by any outside powers. The movement has always emphasised this. 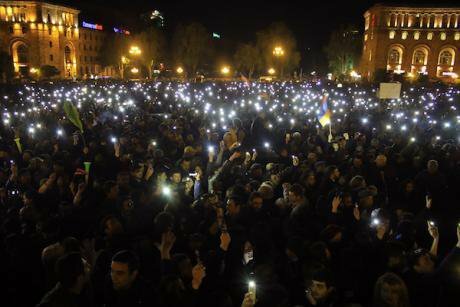 The Electric Yerevan movement was tied to the Russian state-owned electric company. Electric Yerevan, however, was still able to overcome this geopolitical aspect, as illustrated by the popular slogan: This is Marshal Baghramyan Avenue, not Maidan. June 2015. Electric Yerevan protester stands on barricades with placard: "We are becoming a country." Source: Karena Avedissian. Secondly, the Russians have understood that if they see a Maidan everywhere they look, that is very dangerous for them. Ukraine was a huge lesson for Russia. There is another thing. We have a new Russian ambassador, and I think the Armenian government has not had the opportunity to have an influence on him. Thus, the information that he is relaying back to Moscow actually reflects reality. The previous ambassador had a lot of ties with the government. I don’t think the Armenian government has yet had the opportunity to do the same with this new ambassador. Thus, Russia has a more real idea of what is happening on the ground in Armenia now. That might have to do with why Russia has not gotten involved. I am not saying that is the main reason, but Russia does have experience now after Ukraine. It may be that the Russians understood it might be better just to allow a new person to come into power. That is why there were very balanced statements from Russia regarding the movement. Yesterday, Maria Zakharova [Russian Foreign Ministry Spokesperson] said something important. She said that this needs to be resolved in a democratic way — Zakharova said that! Actually, she said that it needs to be resolved with the law and democratically. And anyway, everyone here understands that this is not an anti-Russian movement. The movement, within Armenia, is singularly opposed to Serzh Sargsyan. So Zakharova put the law and democracy on the same level in this case. Yes. So in that way, it was very different. Just today I gave an interview to the BBC, and they kept asking about the geopolitical aspect and Russia. We need to do everything we can in order to avoid that association. When there is a perception that other powers are involved, things get very complicated — demands increase, someone wants this, another person wants that. That is why this must remain internal. That is one of the reasons for our success. This also constrains Serzh Sargsyan. Has there been any involvement from the US and EU, aside from the statements of concern they have issued? No, I think they are simply following the developments. It is interesting that we have a lot of popular support internationally for the movement. People understand that this is a democratic process, and that they need to support this process. The Office of Democratic Institutions and Human Rights (ODIHR), which is the body that monitors elections, and the State Department have issued statements. 23 April: Republic Square, Yerevan. (c) Ani Djaferian/Zuma Press/PA Images. All rights reserved.This is interesting because before during previous protest movements, it was always the US ambassador who would make statements. The international community in the main have reacted very adequately. And it has given us hope that something will work out. Have there been new concerns, in terms of Sargsyan’s rule, that have been identified during this cycle of mobilisation? Not really. We were able to identify all the problems initially, and during the mobilisation, we have presented them. For example, we have shown that [over 2009-2015] 70,000 more citizens have emigrated. We have highlighted that, and the public has been in agreement with our identification of problems. The electoral system in Armenia is broken. In this sense, are protests an effective accountability mechanism for holding government accountable? That has been one of the things that we emphasise in our speeches: citizens have two ways of holding their government accountable — one is elections and the other is street protests. They have manipulated the elections and have left us one option. Our government has not left us any other channel to hold government accountable. That is why people are in the streets. They wanted to rig the elections and not be held accountable? During the 2016 Sasna Tsrer crisis, there was a degradation and radicalisation of Armenia’s public sphere. How, in comparison, is this movement framing this contention, and what are the narratives? What kind of language are the protesters and organisers using this time? Perhaps you can say that there are two elements at play in Armenia. On the one side you have radicals, who want to achieve their aims with weapons. And on the other, there are people who want to reach their goals in the most peaceful way, for example hunger strikes. We have chosen the middle ground between these two. And we have created the space for people from both extremes to join. This is perhaps one of the most important factors. Even the people tied to Sasna Tsrer [supporters of Sasna Tsrer and the Pre-Parliament group] have been with us. It is possible they did not do much for us — because they think differently. But I can say in the first march where we had 100-150 people, maybe 40 of them were people tied to Sasna Tsrer. Thus, we have chosen something in the middle that has given both sides the space to express their own grievances. You can sit peacefully in the street if you want — the important thing is that you are doing something. If people wish to only come to the rallies and speeches, then they can do that. The youth, for example, only want action and don’t like the rallies very much. So, this movement has given the opportunity for people to do what they want. As a result, you can mobilise more people. Have there been any changes or developments in terms of law enforcement tactics or strategies for crowd control, use of equipment, detentions, and arrests? We actually did was something similar on 18 April, when we went towards the Parliament on Baghramyan Avenue with Nikol Pashinyan. The police made a push and used stun grenades and 46 people were injured, including police officers. The use of force was asymmetrical. Some people’s heads were completely covered in blood. In that way, the police does not really change the way it operates. But we understood how to paralyse that system — to use a decentralised, networked organising structure. We did actions in various parts of Yerevan — we never gathered all in one place. The police did not know what to do. At one point they just began smashing cars that were left to block roads, and they were pulling people over for honking — yet everyone in the city was honking! At one point during the protests, we were a few people gathered on Abovyan Street, 30-40 people, and at some point, 10 policemen arrived who could detain us, but there was no police vehicle. So they stood there and waited for the vehicle. As soon as they brought their vehicle, the protesters grew in numbers, and there was suddenly 100-150 of us. They managed to detain a few people, but we then began to move in different directions. They were paralysed. Near City Hall at one point the streets were shut down and the police came in 10 vehicles and opened it up — everyone ran away. They detained maybe two people. Everyone else managed to get away. Then after 15 minutes, everyone came back to the same spot and closed the street down again [laughs]. And this networked style worked in different parts of Armenia. Yerevan's Republic Square. (c) Gevorg Ghazaryan/Xinhua News Agency/PA Images. All rights reserved.I could feel yesterday that the police were just morally broken. They cannot deal with the sheer numbers of protesters either. When a policeman is outnumbered, he just does not know what to do. And further, since we are not presenting ourselves as their enemies, we are not injuring them, we are not doing anything to them out of anger — they cannot feel themselves as legitimate anymore from a moral standpoint. Yesterday I walked all day, and although we had shut down the city and there were big traffic jams, I did not hear any complaints from residents about the traffic. Everyone was honking in support. No one was complaining about the closed roads. People have realised that this is for them as well. That even if they are not participating in protests, that it is still for them. It is for the common good. Where else have there been actions outside of Yerevan? Ijevan, Vanadzor, Gyumri. And it happened just as the authorities began sending law enforcement to Yerevan from different parts of the country; they then had to send them back to these respective towns. We paralysed most parts of the system. We also knew that people in the government were following the events live — they could not get any work done. No one could do anything, because such a huge event was happening. You can’t get any work done in that environment. I know someone who lives abroad — she is from Ashtarak, and she came to join the movement, and she went to Ashtarak to organise. And in the regions, police don’t really detain women, so they let her go. The police in the regions just cannot compute how young women could be protesting. This friend had been studying in Warsaw, and the police could not understand how a young woman studying in Warsaw could be in the street protesting. This might be the first time we put into action such a large decentralised movement in Armenia. The 100 Dram movement was also decentralised, but not as big. The Mashtots Park movement could not have taken place anywhere else but Mashtots Park. In a centralised movement, the police always have an advantage. There is a funny thing that happened: yesterday, police tried to arrest people in a Yeraz van. The police detained a protester and sat him in this Yeraz, and when they opened the back door to put someone else in, he escaped [laughing]. How has Armenia’s diaspora shown its support of the movement? It is very interesting that from the very beginning and throughout this mobilisation, the Russian-Armenian Diaspora has been very active in their support for us. In the beginning, Russian Armenians had done the most fundraising to support the movement. This has been very interesting. At one point we were marching, and someone said something about the need for loudspeakers, and then we get five loudspeakers, sent from Moscow. It also feels like we have total support from the rest of the diaspora; it feels as though no one would say we are not doing the right thing. Of course, we make mistakes, and we try to learn from them, but no one is telling us we are wrong for doing this. It is a very legitimate process for them too. People are beginning to self-organise in the diaspora, people write to me asking how they can help — independently of one another. They help financially, morally — in every way. And people are coming to Armenia from abroad to join the protests. Just yesterday someone came from the US. And I believe that if we are successful, he will stay. People have come from Russia, from Germany — this has been the dream for many people for a long time. Are there any signs of support for the movement from within the Republican Party? Yes. Serzh Sargsyan made one mistake. He deceived many people, including people within the Republican Party. You can only burn so many bridges. He has just suggested that we negotiate. But none of us see him as worthy of sitting at a table with. He has thought that you can always lie to the public. Thus none of us sees any point in sitting down with him — there won’t be any result. And he is the one who wants to meet, not us. In various negotiations, Serzh Sargsyan has deceived everyone. And these protests are the result. I spoke to Armen again on 27 April in a car heading to an opposition rally in the northwest city of Gyumri, days after Sargsyan’s resignation. Serzh Sargsyan resigned on 23 April. How was the movement able to achieve one of its most significant goals? One of the reasons we won was that the authorities saw this total mobilisation of Armenian society. At some point, the government began showing some very significant cracks. I also think that as Serzh Sargsyan saw a brigade of military peacekeepers join the movement [referring to the soldiers in uniform who broke out of their positions to join protesters on 23 April] — at that moment, Serzh Sargsyan understood that if he continued, that it was possible that many people would not follow his orders and the system overall might collapse. Law enforcement were also demoralised. For example, in my interactions with the police, I just felt that they were not trying anymore. I think our tactical approach worked very well — we are not trying to make enemies of the police, and there has always been an emphasis on framing the police as “ours”. Serzh realised that if he wanted to get out of the situation, he only had one option: to use total force at any cost, up to and including bringing in tanks. But he went in the opposite direction. I think that people in his circle convinced him not to go down that other road, telling him that the only way to calm the situation was to go. What are the movement’s goals now? From the very beginning we wanted to start with small goals, for example, at a minimum to ruin Serzh Sargsyan’s inauguration party and then going all the way to Serzh’s resignation. We have always said that if there are sufficiently large crowds in the street, we can demand the total ouster of the Republican Party. At this point in time, I think that we are on the way to removing the Republican Party. And we see this as happening through a temporary government, as it must be headed by the people’s representative. And for snap elections to be organised, it is crucial to change the electoral code, as well as to make changes in the Central Electoral Commission — to change some people on the inside. That much. And then elections. What are the next steps that the opposition has planned over the next few days? Since we are on the Yerevan-Gyumri highway right now [where at every village we passed, villagers were out on the highway cheering on the opposition caravan], I can say — and you can see yourself — that there is essentially total societal support for this movement. There is even support from Armenia’s state agencies. It is not visible, but it is clear there are people inside who support this, in particular from middle and low level bureaucrats — people who did not do well under Sargsyan. In this way, the regime has been left totally isolated. It is possible Karen Karapetyan will try to steal the movement’s thunder and bring in people from Moscow, but I am convinced that Moscow has understood that it is pointless to intervene in this process. As I said in my last interview, Russia has learned its lesson in Ukraine. This movement is a totally internal phenomenon. When these street actions end, the people will choose their candidate, and Russia will try to work with that. Russia seems to know that if they intervene, public opinion will totally go against them, and that will be disastrous for Russia. It will be best for Russia to stay out of it and allow the internal situation to settle. What obstacles do you see yourselves facing in this next stage? Serzh Sargsyan, having control over the whole government and all its branches, was still not able to morally defeat this movement and he was forced to resign. Karen Karapetyan does not even quite control everything, law enforcement is demoralised, and I think that the army will not interfere on Karapetyan’s behalf. Thus, Karen Karapetyan is in a weak position, although he is trying to show that he is ready and capable of doing things. But in any case, Karen Karapetyan will go, there is no doubt about that. He has no other option. He does not have societal support, nor is he a strong political player. He is the one that essentially put forth Serzh Sargsyan’s candidacy for Prime Minister by coming to Armenia from Russia. He has some educated people from the west on his side, but this is not enough. At this point in Armenia, the strongest source of power right now is the opposition rally platform which right now is competing very well with the authorities on many issues. 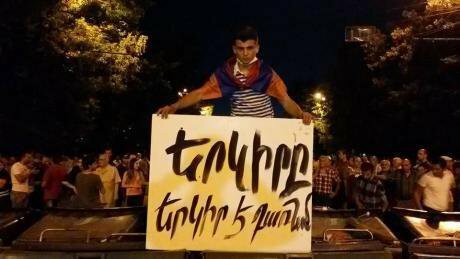 Just for example, there was an issue with people driving with their license plates covered, and after Nikol [Pashinyan] made an announcement from the rally platform saying not to do that, in less than 24 hours, that problem was completely resolved, without any involvement from the police. It is even possible to say that the opposition has a better organised response to everyday public issues caused by the protests than the police. The public is able to self-organise and solve these problems without the police. People are prepared to take responsibility and organise measures.